Golfer’s elbow or to give it its proper medical name, medial epicondylitis, is a tenderness felt on the bony prominence of the inside of the elbow joint where the tendon attaches itself to the bone and becomes inflamed. It is usually brought on by gripping of the fingers or flexing of the wrist and is most common in the dominant hand. So for a right handed golfer the pain is usually experienced in the left elbow and vice versa. It’s Not Just For Golfers! Although known as golfer’s elbow it is not limited to golfers. Racquet sports players, weight lifters, archers, cricketers and the like are all as likely to suffer the condition. 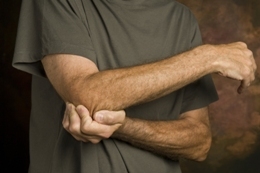 Occasionally the pain may extend above the elbow and some people experience pins and needles as well as a weakened grip. Pain may also extend down through the muscles to the wrist. At Touch2Heal our practitioners use joint mobilisation and deep soft tissue work to treat golfer’s elbow. Our practitioners will also advise on some simple exercises aimed to relieve the condition. If you have golfer’s elbow then call us today to see if we can help. Book an appointment at our clinic in Ashford in Kent. I tried several different treatments for my golfer’s elbow but none seemed to work until I tried Sharron who miraculously sorted me out. Can’t thank her enough!